If you’ve never had to deal with a toothache, then there’s a good chance that you might at some point in your life. The good news is that it isn’t always an immediately serious condition, but if ignored long enough, even the most minor toothaches can progress into much more severe pain. Because a toothache can have such a wide variety of potential causes, there is no one-size-fits-all treatment for one. Instead, your dentist will carefully examine your teeth and diagnose the cause of your discomfort, then consult with you to determine the best way to deal with it. Your teeth are comprised of layers, and the outermost one (called enamel) is made almost entirely of highly resilient mineral crystals. When healthy, tooth enamel blocks sensations from reaching your main tooth structure, known as dentin. Therefore, you should feel little beyond the pressures of biting and chewing. However, when enamel grows weak, your teeth become much more sensitive to things like oral bacteria, hot and cold foods and beverages, and more. Weakened tooth enamel is also a precursor to the development of tooth decay and cavities. If you ignore your sensitive teeth long enough, they can become increasingly more painful as oral bacteria infect their structures. Even if the crowns of your teeth and the enamel that protects them are healthy, your teeth could still become sensitive and achy if their roots become exposed. Unlike the crowns, your teeth roots are only covered by a layer of resilient of enamel. The gum tissues that cover them are their main lines of defense. 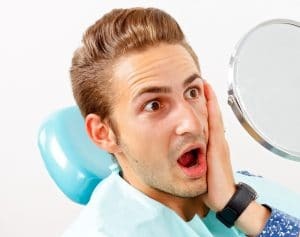 When gums recede, which is often the result of overaggressive tooth brushing, gingivitis, or more, they leave your vulnerable teeth roots exposed and sensitive to all forms of irritation. Whether your gums recede too much or your tooth enamel wears down too thin, any exposed tooth structure is vulnerable to infection (decay) by harmful oral bacteria. When these microbes reach your tooth’s dentin, they can quickly lead to an infection that forces a cavity to form in the tooth. The pain of a cavity grows increasingly more severe the closer it is to the tooth’s pulp chamber, which houses its nerves and blood vessels. If your tooth is in the grips of severe pain, then you may require treatment as soon as possible to save the tooth. Your tooth could hurt for a variety of reasons, but whatever it is, it likely won’t get better address its specific cause. For more information, schedule a consultation by calling Syosset Dental in Syosset, NY today at 516-433-2211 or 516-921-6930.